The uniqueness of the Alberto Tallone Printing House consists in bringing the figures of publisher and printer together, in conformity with the canons established in the Renaissance. 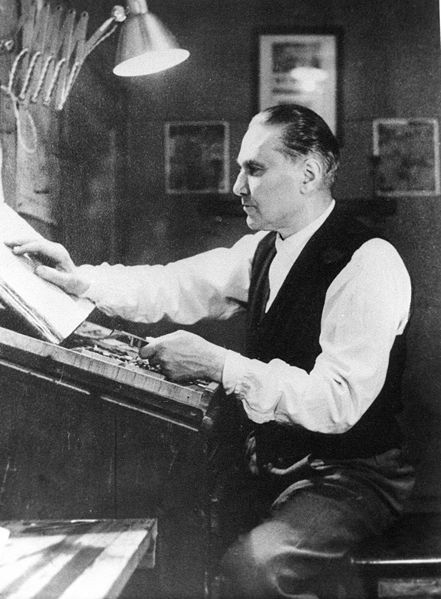 Alberto Tallone, the son of crepuscolar painter Cesare, head-professor of painting at the Brera Acadamy in Milan, had been running an antiquarian bookshop in Milan when, in 1931, a the age of 33, he decided to move to Paris and become apprentice at Maurice Darantiere’s typographical workshop, whose origins dated back to the 18th century. In 1938, Alberto took over the workshop. He enriched the existing collection of mobile types by adding Greek and Latin ones. Among them, were the Tallone types designed by him himself in 1949. 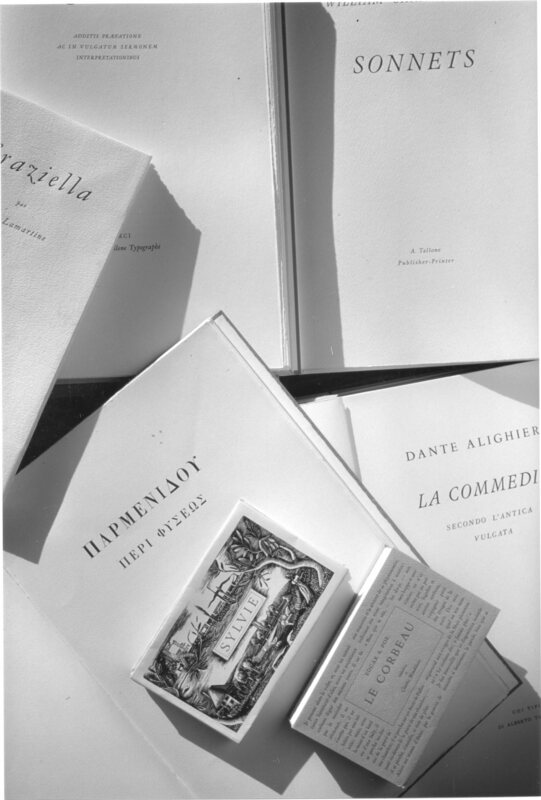 The Alberto Tallone Printing House publishes a few editions every year, each consisting of some 300 copies. The book are set by hand with original lead types (whose matrices date back to the 18th century), thus giving continuity to Gutenberg’s time honoured tradition. Texts are printed on acid-free paper made of pure cotton, that are intended to last in the centuries. Tallone’s printed works, ranging from Greek Presocratic Philosophers to modern and contemporary poets, are edited by the most important philologists. Infact, the Printing House credits the greatest importance to its books considering both their graphical and their philological aspetcts. Believing in the beauty of typographical pages, most of Tallone’s book lack illustrations (apart few exceptions, such as Perrault’s Fables, where each tale is accompanied by original wood engravings). In 1959 Alberto moved to Alpignano, in Italy. A year later the official opening of the Alpignano Printing House was staged in the presence of the Italian President Luigi Einaudi. The Printing House has been, during the years, the favorite destination of pots and writers such as Miguel Angel Asturias and Pablo Neruda, who entrusted some of his unpublished to Alberto. In this machine-ridden epoch, Tallone’s printed works represent the undying continuity of the aesthetic model set by the Master of the past, Aldo Manuzio and Giambattista Bodoni in the first place.